Other Ingredients: Malic Acid, Xanthan Gum, Natural and Artificial Flavors, Citric Acid, Silicon Dioxide, Sucralose and Acesulfame Potassium. Caffeine Free. Build And Preserve Muscle. Fat Loss and Cutting! Re-Fuel and Recovery. Who Says Your BCAA Formula Cant Help You Get Ripped? Fast-Acting BCAAs, plus MCTs and CLA. 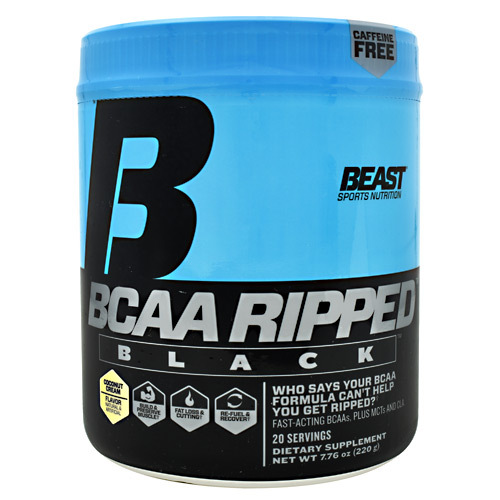 This Is The BCAA Formula That Helps You Muscle Up, Get Ripped, Fuel Epic Workouts And Recover, All With Zero Caffeine. No Other BCAA Formula Combines Instantized BCAAs (For Lean Muscle and Recovery) With MCTs (For Fuel and Stamina) And CLA (To Help You Burn Fat), all Wrapped in Flavor youll Never Get Tired Of. Plus, its Caffeine-Free, so you can Take It Whenever You Want. Directions: Mix One (1) Level Scoop With 12 FL Oz. Of Water. Take Before, During And/or After Workouts And/or In Between Meals. Taste Awesome With Ice! Warnings: Allergen Warning: This Product Was Produced In A Facility That May Also Process Ingredients Containing Milk, Eggs, Soybeans, Shellfish, Tree Nuts And Wheat. Storage Conditions: Store in a Cool Dry Place. Warning: Check With A Qualified Healthcare Professional Before Using This Product, Or Any Dietary Supplement, If You Are Under The Age Of 18 Or If You Have Any Known Or Suspected Medical Condition(S) And/or Are Taking Any Prescription Or OTC Medication(S). Do Not Use If Seal Is Broken Or Missing. Keep Out Of Reach Of Children. Note: The High-Potency MCTs And CLA Used In This Product May Settle To The Bottom Of Your Cup Or Glass. This Is Normal. Shake Or Stir Well Before Drinking.